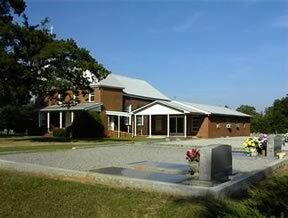 From the Hancock County Courthouse, go east 0.3 mile on Hwy 15/16 to the fork at the Sparta Baptist Church. Bear left on Hwy 16 to the northeast and go 4.4 miles. 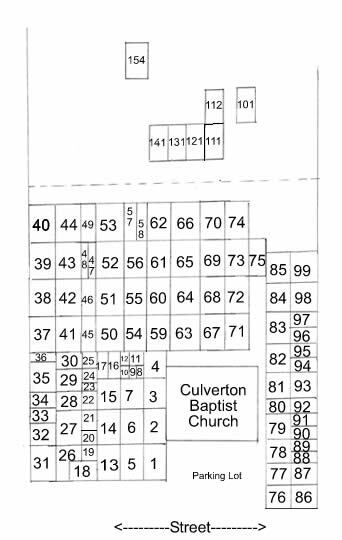 Turn left and go across the railroad tracks for 0.3 mile to Culverton Baptist Church and cemetery on the right side of the road. This cemetery is organized into family lots. The lots are shown on the above map. The diagram is not to scale but the relative positions of the lots are reasonably accurate. Graves in lot 999 have been added since the original survey and are located somewhere within the cemetery. Identification of their lots has not been made. Name on central monument with Mary J. Moore. Under one of the unmarked slabs in this lot, probably the one with the CSA marker. probably belongs to James W. Moore. w/o James W. Moore. Under one of the 4 unmarked slabs in this lot. On central monument. d/o R. H. & A. M. Lewis. s/o R. H. & A. M. Lewis. She was a kind and affectionate wife, a fond mother and a friend to all. w/o Lewis E. Culver. A small headstone with only "I" on it. Last name assumed. Possibly an Infant. s/o L. E. and S. T. Culver. Small headstone with only "I" on it. Last name of Culver assumed. Possibly an infant. 2 cement blocks lying at head of graves. line of duty during the Battle of Java. What doth the Lord require of thee, but to do justly and to love mercy, and to walk humbly with thy God. Let not your heart be troubled, ye believe in God, believe also in me. Jesus said, "Because I live, ye shall live also"
To do justly, to love mercy, and to walk humbly with thy God. d/o R. H. & M. M. Moore. On same headstone as Anna L. Moore. d/o R. H. & M. M. Moore. On same headstone as Mary C. Moore. s/o L. R. & A. L. Moore. "Our baby"
I go before you to straighten the crooked path. In memory of our mother. w/o T. B. Reams. His many virtues from the noblest monument to his memory. star, a heart, a tank with tank tread. "Rhodes" on coping around this lot. w/o John L. Culver. "Blessed are the dead who die in the Lord, they rest from their labors and their works follow them." d/o John L. & Mary L. Culver. "Precious in the sight of the Lord is the death of His saints"
s/o John L. and Mary L. Culver. "Of such is the Kingdomof heaven"
s/o Henry E. and Mary H. Moore. "Forever and ever -- "
Loyal wife of Henry Edwards Moore. 'Tis but the casket lies here, the gem that filled it sparkles yet. d/o Henry E. & Mary H. Moore. In God have I put my trust. On same gravestone as Mabel D. Beall. White marble headstone, no markings. Possibly 2 graves - depressions. w/o W. H. Culver, d/o J. S. and Elizabeth Latimer. She died as she lived Trusting in God. He followed virtue as his truest guide, Lived as a Christian, As a Christian died. On back of stone: Come ye Blessed. On same gravestone as graves 7-16.
w/o Hardy C. Culver. Tho' lost to sight to memory dear. On same gravestone as graves 6-16.
w/o Daniel Connell, d/o Hardy C. & Ann L. Culver. And her four children (graves 9-12 are her four children listed on this gravestone). Listed as a child of Anna E. and Daniel Connell. Listed as a child of Anne E. and Daniel Connell. s/o Hardy C. and Ann L. Culver. On same gravestone as graves 6-16.
s/o Hardy C. and Ann L. Culver. d/o Hardy C. and Ann L. Culver. He carries the lambs in his bosom. w/o B. F. Johnson. Rest mother, rest in eternal sleep while loved ones in sorrow o'er thee weep. d/o J. H. and Mattie M. Akridge. A field stone marks the grave. 2 graves marked with field stones. Infant of Mr. & Mrs. T. L. Davis. "Our baby". Last name assumed. On same gravestone as Kirby G. Howell. We can safely leave our darlings in thy trust. On same gravestone as Henrietta B. Howell. A field stone shaped as a headstone. In loving memory of husband and father. Headstone has initials in a ring: K S H T W S S T.
Co. K 15 Ga. Inf. Father and Mother, Dear Parents, Thou Hast From Us Flown, To the Regions Far Above, We to Thee Erect this Stone, Consecrated by Our Love. w/o Benjamin C. Culver. On same gravestone as Benjamin Culver, with common epitaph (see 20-0). On same gravestone as Sallie T. Culver, with common epitaph (see 20-0). d/o B. H. & A. L. Waller. A little bud of love to bloom with God above. w/o Rev. G. W. Thomas. Gravestone broken at birth date. BDate per Mary Ann Willoughby's listing done earlier. Father thou has grom us flown to the regions far above; we to thee erect this stone consecrated by our love. Blessed are the dead which die in the Lord. b. Brunswick County, Va., d. Devereaux, Ga. w/o A. H. Foster. b. Brunswick County, Va. d. Culverton, Ga. They shall be mine, saith the Lord of hosts, In that day when I make up my jewels. On same monument as Mary E. Stone. Loving mother of Sterling Adair Harris, Moses Wiley Harris, George Gardiner Harris. s/o Sara Waller Harris and Moses Wiley Harris, Jr.
s/o George C. and Hattie Waller. s/o G. C. and Hattie C. Waller. Beloved husband of Marjorie Lee Harris. Beloved wife of Sterling A. Harris, Sr.
s/o G.C. & H. V. Waller. We can safely leave our son, our darling, in thy trust. w/o J. I. Johnson. In Jesus' arms we laid her down, a lovely jewel for his crown. s/o J. I. & Winnie D. Johnson. The fairest flower we fondly love, how soon it fades. A cross. Rough stone at foot of grave. No death date as of May 2003. Death date on military marker reads Nov 28. On same gravestone as Sidney S. Dunn. On same gravestone as India B. Dunn. New grave as of 2003. Infant-sized. "Mama Joy". Musical notes on grave. If tears could build a stairway, And memories a lane, I'd walk right up to heaven And bring you home again. Carved angel, lamb and dove, with photo of child on gravestone. "Mother" "Mumsie Mawmaw". A lighthouse at foot of monument with "1881 St. Mark's, Fla"
"Mother" "MER" at foot of slab. 1st Lt. U.S. Army Air Corp.
On same gravestone as George G. Power. On same gravestone as Vera Dunn Power. w/o J. C. Smith. "Mother"
"Mr. Tee" On same headstone as Frances F. Griffin. On same headstone as Thomas H. Griffin. "Mother" On same headstone as Alfred B. Kilgore. "Daddy" On same headstone as Olive G. Kilgore. "Tim". The Lord is my shepherd, I shall not want. "Mother" On same headstone as Harper S. Kilgore. "Daddy" On same headstone as Sophenia M. Kilgore. Ga PFC Co B 56 Signal BN. T Sgt U.S. Army Air Corp.
On same headstone as Warren E. Clark. Clark is spelled without the "e". "Bo" On same headstone as Enda C. Clark. Clark is spelled without the "e". s/o Beverly and Michael Boyer. d/o Warren and Enda Clark, per obituary. m. Jun 8, 1939 to Gladys Raley Askew (on same headstone). "Pappy"
m. Jun 8, 1939 to Ostell Askew (on same headstone). "Granny"
m. Jul 8, 1933 to Ernest Askew (on same headstone). m. Jul 8, 1933 to Mildred Jackson Askew (on same headstone). Georgia Wagr Sup Co 166 Inf 42 Div. Faithful to his trust, even unto death. "Mama" "Nanny" On same gravestone as E. Douglas Foster. "Daddy" "Duck" On same headstone as Mary C. Foster. m. Jan 10, 1942 to Robert Henry Long (on same headstone). m. Jan 10, 1942 to Annie K. Foster Long (on same headstone). m. Nov24, 1934 to James Plemon Johnson (on same headstone). "Mama"
m. Nov 24, 1934 to Susie Mae Johnson (on same headstone). "Daddy"
m. Wed., Apr 11, 1930 to William A. Dunn (on same headstone). m. Wed., Apr 11, 1930 to Sara G. Dunn (on same headstone). Masonic emblem. Sweetly sleeping, we humbly trust him to the Savior's keeping. Emblem with the letters, E, B, L.
"Father". Prepare to meet me in heaven. An iron CSA cross on his grave. She was the sunshine of our home. Handwritten on old slab is birth date of Oct 17, 1904, not 1903. Last name spelled with an 'e'. In loving memory, Anita Marshall, Louise Thurston, Steve Appleby, The Smith Family. Our dear Mama. One son and six daughters. Shares gravestone with Robert L. Minges. A devoted son and friend to all. On same headstone as Truman N. Wells. On same headstone as Ellen S. Wells. "Mama Granny" On same headstone as John Neal Wells. "Daddy PaPa" On same headstone as Clyde Y. Wells. m. Oct 14, 1933 to Myrtle E. Johnson Dunn (on same headstone). m. Oct 14, 1933 to Percy Lee Dunn (on same headstone). On same headstone as Joe J. Poole. On same headstone as Inez N. Poole. Georgia Sgt U.S. Marine Corps. On same headstone as A. Milton Worsham. On same headstone as Sara K. Worsham. On same headstone as Ralph J. Duckett. On same headstone as D. P. Askew, Jr.
On same headstone as Ruth M. Askew. "Mama" Beloved w/o Robert B. Hyman. heart, (bronze?) star, and rifle. "Mother" On same headstone as Hampton Pilcher Brake. "Father" On same headstone as Nancy Stapleton Brake. Lot is empty as of May 2003.
m. Sep 226, 1942 to Bob Milton Poole (on same headstone). "Mama, Ma, Fannie"
m. Sep 26, 1942 to Fannie B. Poole (on same headstone). "Daddy"
"Mama" On same headstone as Thomas W. Brown. "Daddy" On same headstone as Josephine A. Brown. "Mama" On same headstone as Thomas Loren Brown. "Pa" On same headstone as Carrie Swint Brown. On same headstone as "Bill" Burnice Arnold, Jr.
On same headstone as Norma Louise Arnold. On same headstone as John S. May. On same headstone as Wilma W. May. No marker. Lot boundary has a T on it. "Mother" "Perdue" On same headstone as John Milledge Perdue. "Father" On same headstone as Mary Brown Perdue. m. Sep 11, 1943 to Clarence Edward Haynes (on same headstone). m. Sep 11, 1943 to Marian Tifft Haynes (on same headstone). On same headstone as Hardy Buford Norris. On same headstone as Bessie Meeks Norris. "Bobby beloved son and brother"
On same headstone as Mack Bert Mauldin. No death date as of May 2003. Name of "Milligan" from foot marker. No death date as of May 2003. On same headstone as Dorthy Ann Mauldin. On same headstone as Raymond Sidney Askew. On same headstone as Carolyn Bargeron Askew. Age 88. All info from obituary.